Ceemet and industriAll Europe, the representative European social partners in the metal industry, have long been jointly advocating for first-class vocational education and training (VET) strategies to support the Metal, Engineering and Technology-based (MET) sector in thriving in, and adapting to a fast-evolving world. As they join the European Alliance for apprenticeships today, 27 June 2018, industriAll Europe and Ceemet give a further push to the promotion of quality and effective apprenticeships schemes and the improvement of VET image and attractiveness towards youth, hence taking up the skills challenge in the MET industries. Brussels, 27 June 2018 - The fast-paced transformation of our industries driven by mega trends such as digitalisation, climate change, globalisation and an ageing society is heavily impacting the skills needs that are required in the MET industries. It is high time for swift initiatives to ensure that MET sector companies and workers are able to cope with those major transformations in a socially responsible manner, thereby supporting the growth, innovation, competitiveness and ability of the MET sector to create quality jobs. Social partners have a key role to play, as Ceemet and industriAll Europe have once again demonstrated at their joint conference organised in the Committee of the Regions. Social partners’ achievements in the area of education and training, such as the adaptation of job profiles to the digitalisation of the German metal industry, were showcased during panel discussions. The EESC representatives, Ms. Angelova and Ms. Babrauskiene presented their suggestions to overcome skills shortages while acquiring the right knowledge and skills to meet the future the skills needs. The highlight of the conference was the official signing of the industriAll Europe and Ceemet pledge on apprenticeships. With this pledge, industriAll Europe and its 181 trade unions affiliates in 38 countries as well as Ceemet and its member organisations in 22 countries of which 20 are in Europe commit to promote quality and effective apprenticeship schemes in the MET sector throughout Europe. “We did not wait for European policy-makers to shift the focus to skills, as has finally been done in the past couple of years, and to stress how instrumental it is for our sectors to secure a highly skilled workforce thanks to initial and continuing vocational education and training”, said Luc Triangle, industriAll Europe General Secretary. “Ensuring workers acquire and regularly update the skills they need via work-based learning, particularly in specialised and technology-dependent occupations, is in the DNA of the metal industry. Efforts must be stepped up given the scale and pace of the technological, economic and social transformations our industries are confronted with. Social partners will continue to contribute to this effort. 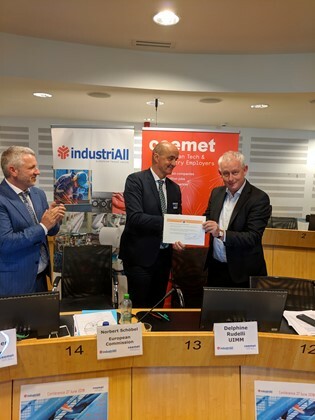 Signing a joint pledge to support the quality and image of apprenticeships is one additional step Ceemet and industriAll Europe want to make in this direction”. “Vocational education and training, and specifically apprenticeships or dual learning, was one of the first topics our organisations decided to tackle jointly well before setting up our formalised European sectoral social dialogue committee in 2010”, recalled Uwe Combüchen, Ceemet Director General. “VET and apprenticeships schemes should become more effective and qualitative as they lead to good jobs in an internationally competitive industry. IndustriAll Europe and Ceemet have been promoting the attractiveness of these learning paths ever since. Within the current digital transformation of industry, social partners are the closest to the real challenges and needs that workers and employers face. Specific agreements like the one presented today show how tailor-made solutions can be achieved through a structured exchange. These initiatives must be rolled out across Europe.” concludes Uwe Combüchen. IndustriAll European Trade Union and Ceemet joint pledge on apprenticeships is available here.